Hi all. Just received a text from Orange / T mobile. (My service providers). ;;;; Wair for it............ A whopping 58.5 Mbps. Yup thats Mega bps. Currently I am receiving about 10 Mbps. The interesting thing will be the cost difference. They ommitted (I wonder why?) the cost in the text.. mmmmmm..Watch this space. Sounds like a 4G connection, does your phone support it. Yup, you are right Mike. Its the new 4G. A little confused though as I am being told that my phone will support it. (Samsung galaxy S3). Yet all the websites I go onto are telling me that I need to upgrade to a Galaxy S3 LTE. Also having a poke around on the net I am not sure that it will be that much faster as on occasion the 3G loaded a tad faster than the 4G. As usual me thinks its down to where you are at the time and what areas are supported by the new 4G. All hype as usual. Will wait a few months and see what transpires and of course what costs are involved. the Internet’ report for Q3 2010 has just been released, revealing interesting statistics about the net around the world. For any geek, the results for Australia are a slightly depressing read. The fastest average connection speed for any suburb in Australia was 5.8Mbps in Riverwood, NSW. Having spent a year of my life living in Riverwood, I can honestly say this is a surprise. But the 5.8Mbps – while fast compared to third world countries – doesn’t even come close to cracking the top 100 cities speeds around the world. As a means of comparison, 29 cities in South Korea and Japan manage to get an average speed of greater than 10Mbps, while Constanta in Romania was the top placed non-Asian country in at number 48. Overall, Australia only managed to gain less than a percent overall in the average download speed during the quarter, which is hardly an encouraging figure. But the scariest part is the overall figures. Put on some sombre music, because these figures may be distressing. Now, these figures only include people who connected to the Akamai network, so like any statistic it’s not going to be 100% accurate. But it is an indication of just how woeful our internet infrastructure currently is – we currently rank in at number 48 in the world for average download speeds. That puts us behind New Zealand who come in at 41. 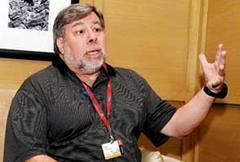 Hi Mike!..according to Google maps our NBA is in progress in our area so will be watching out for our ISP to be in touch, will not be holding my breath though... Steve Wozniak, who co-founded Apple with the late Steve Jobs, revealed Tuesday his fondness for Australia and said he hopes to become a citizen. He was one of the first inline to purchase the new generation iPhone 5.